Hey, everyone! Marcus guest posting here. As most of you know, I do make several of the savory recipes you see here on the blog. I loved creating this Garlic Lime Noodle Soup. I’ve been wanting to make a garlic lime dish for some time and I finally got my chance. The ingredients are simple, it only takes about 30 minutes to make, and it packs quite a flavorful punch. Some of my other savory recipes are my Black Rice Stuffed Peppers and my Sweet Potato Chili. If you don’t want it to be spicy, simply add some diced green bell peppers in place of the chili peppers I recommend. Also, you can add some ginger and soy sauce for an Asian twist. It is such a fun recipe, I’m excited to see how people build upon it. What would you do? 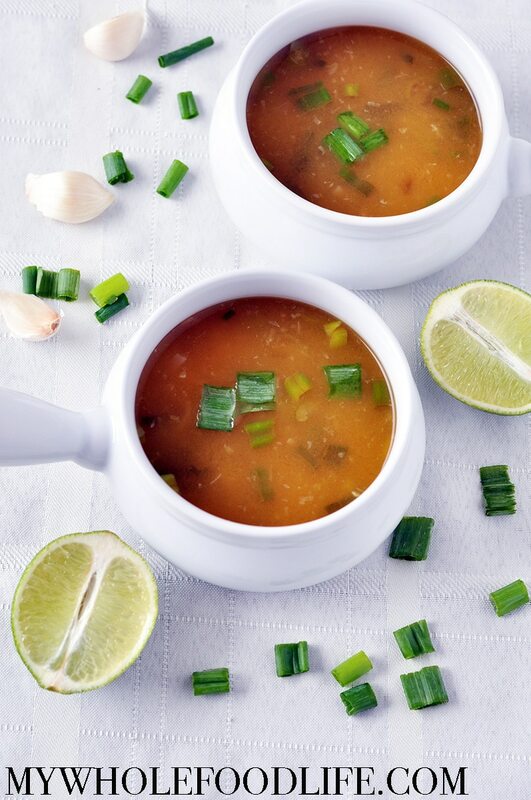 Comforting soup with big flavors! In a large stock pot , bring the water and veggie stock to a slow roil. Add the garlic, lime, and peppers and cover. Let cook on medium low to 20 minutes. Remove the lid and add the brown rice noodles. Let cook on medium low for 7 minutes. Add green onions to the soup, stir and serve. This should keep in the fridge for about a week. If you want more lime flavor, add a 1/2 teaspoon lime zest. Where would I find single serve packages of brown rice noodles? Is there a certain brand to look for? Thanks! When I saw this recipe I thought of the ones called Organic Millet and Brown Rice Ramen by Lotus Foods. This is available at Costco as a very reasonable package of twelve single serving "nests," but I've also seen it in the grocery Asian or ethnic foods section as pricier single serve pouches. No seasonings in these, just the noodles to fancy up as you wish. Well, this came up in my email at a perfect time. We are all just getting over the stomach flu here and I made this (I had to use buckwheat noodles instead) for our first meal after 2 days of living on crackers. It was perfect and I felt the energy slowly fill me back up. Of course, I kept out the peppers because our stomachs are very fragile right now but it was perfect. Thank you. This recipe sounds amazing! And I saw it pop up at the same time I needed to find a recipe for lunch. Cant wait to try!! Thank you - I love spicy food! You are so welcome! I hope you enjoy it!